Tom Glavine (305) and Greg Maddux (355) won 655 games combined, while Frank Thomas hit 521 homers. NEW YORK — A new generation of starting pitchers and a self-proclaimed Mr. Clean of the Steroids Era will be ushered into baseball’s Hall of Fame this summer. For tainted players, however, the doors to Cooperstown remain bolted. Greg Maddux, Tom Glavine and Frank Thomas were elected on their first ballot appearances Wednesday, when Craig Biggio fell just two votes short. Maddux and Glavine will join their former Atlanta Braves manager, Bobby Cox, at the July 27 induction along with Joe Torre and Tony La Russa, also elected last month by the expansion-era committee. But Barry Bonds, Roger Clemens and other stars whose accomplishments were muddied by accusations of steroids use lost even more ground, dropping below 40 percent in an election where 75 percent is needed. And on his first day as a member of baseball’s elite, Thomas said the living members among the 306 Hall of Famers don’t want those with sullied reputations. "Over the last year, doing a couple of charity events with Hall of Famers that are in, they’ve got a strong stance against anyone who’s taken steroids. They do not want them in. They don’t care when they started or when they did it, they do not want them in," he said. "I’ve got to take the right stance, too. No, they shouldn’t get in. There shouldn’t be cheating allowed to get into the Hall of Fame." Making their second appearances on the ballot, Clemens dropped from 37.6 percent to 35.4 in voting by senior members of the Baseball Writers’ Association of America, Bonds from 36.2 to 34.7 and Sosa from 12.5 to 7.2. Bonds, baseball’s career home run leader, is the only seven-time MVP in major league history. Clemens is the lone seven-time Cy Young Award winner. "As for what they did, I don’t think any of us will ever really know," Thomas said. "But I can just tell you, what I did was real and that’s why I’ve got this smile on my face right now because the writers, they definitely got it right." Mark McGwire, appearing for the eighth time, fell from 16.9 to 11 percent — down from a peak of 25.6 in 2008. Rafael Palmeiro will be dropped from future ballots after falling to 25 votes and 4.4 percent — below the 5 percent threshold necessary to remain eligible. One voter submitted a blank ballot. 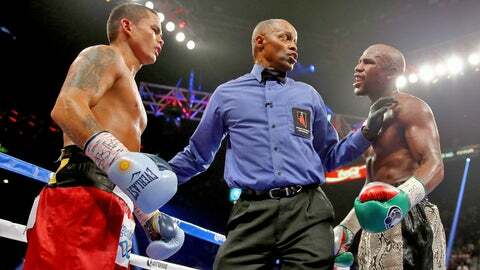 "I can go home and sleep at night and rest," Thomas said, "so I don’t have to worry about all the nonsense that the other people are going through, because I know I won’t be getting a call in the middle of the night from someone saying, oh, he did this or he did that." Miami Herald columnist Dan Le Batard, saying interested fans were more qualified than voting reporters, said he turned his ballot over Deadspin.com, which allowed readers to vote on how it should be cast. "I hate all the moralizing we do in sports in general, but I especially hate the hypocrisy in this," Le Batard said in remarks posted by Deadspin. "I always like a little anarchy inside the cathedral we’ve made of sports." BBWAA secretary-treasurer Jack O’Connell declined comment. Maddux and Glavine become the first primarily starting pitchers to enter the Hall whose careers began after Bert Blyleven, who debuted in 1970. Maddux reached the major leagues in 1986 and Glavine a year later. They also are the first teammates on a starting rotation to be elected together since 1946. Add in Cox, and the induction will be dominated by Braves. "It’s fitting, given the influence those two guys had on my career," Glavine said. "The thing that would have disappointed me the most had it not happened would have been a lost opportunity to go in with Bobby and Greg." Maddux, eighth on the career list with 355 wins, was picked on 555 of 571 ballots. His 97.2 percentage was the eighth highest in the history of voting. Glavine, a left-hander with 305 victories, appeared on 525 ballots and received 91.9 percent. Thomas, who hit 521 homers, is the first Hall of Famer who spent the majority of his career as a designated hitter. He was at 478 and 83.7 percent. 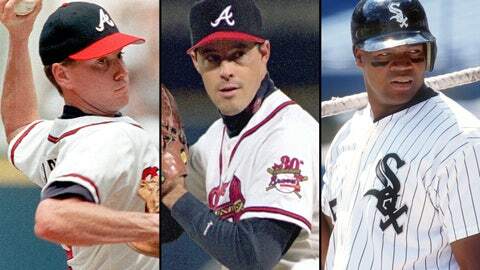 Maddux and Glavine will be the first pair of living 300-game winners to be inducted in the same year. "It’s exciting for me to go in with my teammate," Maddux said. Biggio received 427 votes and 74.8 percent, matching Nellie Fox in 1985 and Pie Traynor in 1947 for the smallest margin to just miss. Traynor made it the following year, and Fox was elected by the old Veterans Committee in 1997. Biggio, who spent his entire career with the Houston Astros, appeared on 388 ballots last year in his initial appearance — when writers failed to elect anyone — and appears to be on track to gain election next year. "Obviously, I’m disappointed to come that close," he said in a statement. "I feel for my family, the organization and the fans. Hopefully, next year." Mike Piazza had 62.2 percent, up from 57.8 last year. Jack Morris was 78 votes short at 61.5 percent in his 15th and final appearance on the writers’ ballot, a drop from 67.7 percent. Morris replaces Gil Hodges (63 percent in 1983) as the player with the highest percentage of the vote not in the Hall. Lee Smith dropped to 171 from 272 last year, his percentage falling to 29.9 from 47.8. Next year’s vote will be even more crowded when Randy Johnson, Pedro Martinez, John Smoltz, Carlos Delgado and Gary Sheffield become eligible, five years after their retirements. The steroids group appears to creating a logjam. Glavine, a leader of the players union in the 1990s, wants to view how opinions evolve. "I understand what’s going on right now, and I think in time it’s going to be interesting to see if the feeling on all those guys changes at all," he said. No votes: Sean Casey (1), Ray Durham (1), Todd Jones (1), Paul Lo Duca (1), Richie Sexson (1), Mike Timlin (1).